The police records for 2009 are out. The 2009 homicide numbers collected by the SNSP (National System of Public Security) are finally out, you can download the data from the ICESI, which is a civic institution not affiliated with the government. The police records in 2008 are missing more than a thousand homicides in Chihuahua! Just to give you some perspective, in Ciudad Juarez, Chihuahua’s biggest city, there were more than 1,600 homicides, more than the 1,414 reported in the whole state according to police records. I strongly recommend against using data obtained from the police records from the SNSP or the UN homicide statistics if you need the latest homicide numbers. I can’t compare the police records to the vital statistics since they won’t be out until November or December, but I can compare them to press reports. 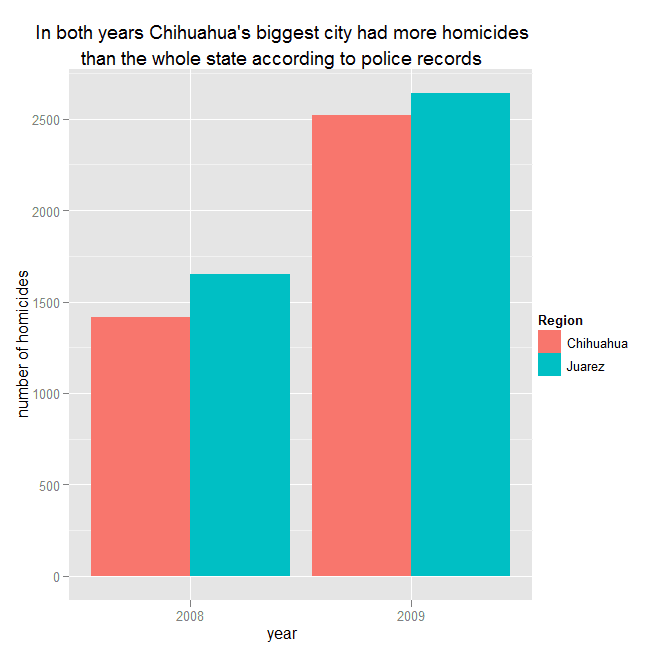 In Ciudad Juarez there were 2,642 homicides during 2009, but according to the police data, in the whole state of Chihuahua there were 2,523 homicides, sigh… history repeats itself. For the whole of Mexico there were 15,255 homicides, which if the number is to believed would correspond to a homicide rate of 14.2. I obviously don’t trust the data and stand by my assertion that the homicide rate according to the vital statistics from the INEGI will be closer to my prediction of 15.5 than 14.2. This is getting to be completely ridiculous. The code to generate the chart is after the jump.